If I’m drinking tea the chances are it is Chai. I drink copious amounts of the stuff. I have a love of cinnamon so what would be more natural than to drink spiced tea, black tea mixed with warming spices, it is just so perfect for me. I’ve tried several brands of Chai, and love them all. Twinings Chai is a regular purchase for me, and if I’m out I like a Chai Latte at Starbucks too. 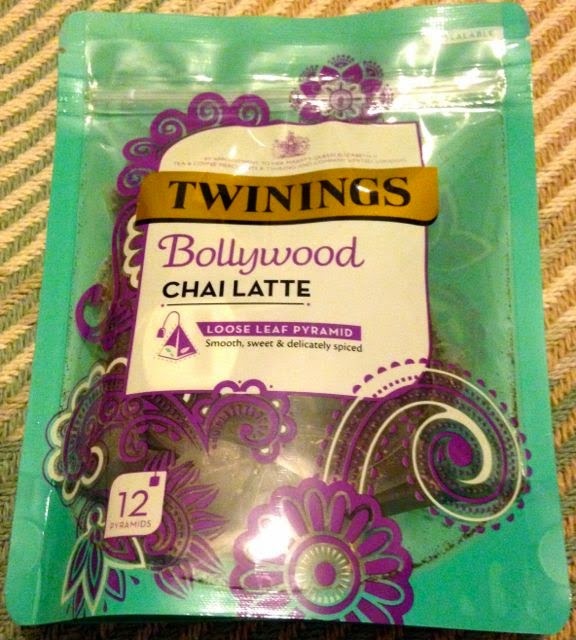 We were out shopping at Waitrose, hunting for Foodstuff Finds, when I spotted in the tea section on a big stand, this new tea from Twinings; Bollywood Chai Latte. How could I resist. 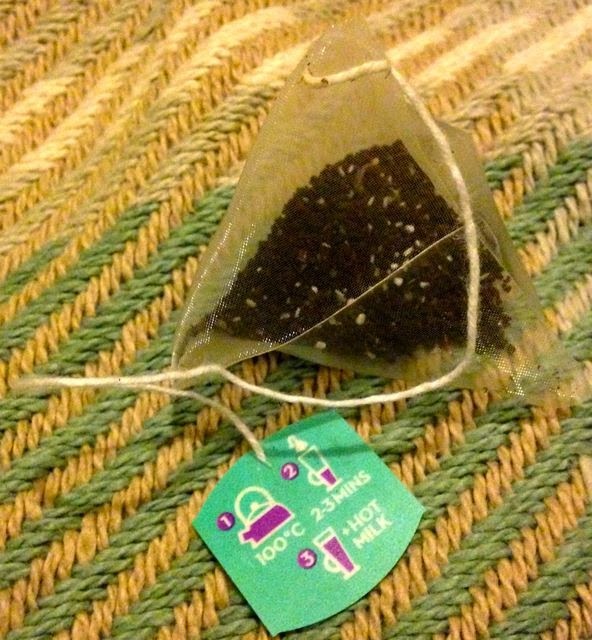 Il ove the posh packaging and the decoration on the bag, inside of which are twelve tea pyramids. I couldn’t wait to try the tea out and the second I was home the kettle was excitedly flicked on. I had a look at the instructions and it suggests making it with a mix of hot water and hot milk, so I readied up the microwave too. The bags smelt really strong before being brewed, but not like I expected. The aroma was like a mix of liquorice, almond and honey, which was a bit weird. I made the tea as per the suggestion on the label and even added a little sugar. I took my first sip and couldn’t believe the taste. It was strong, overly sweet and tasted like liquidised Battenburg cake. I couldn’t finish the cup. It was so almondy and lacking the important spices, the flavours I expected. I have a love-hate relationship with almonds at the best of times, but I do like Battenburg cake. However I do not want to drink the stuff, I only added a half teaspoon of sugar (as per the suggestion on the pack) but the overly sweet marzipan drink it made meant that I ended up feeling a bit sick. If you are going to make a limited edition or flavoured chai the key rule to remember is that spices should be at the forefront, they are the key ingredient. Vanilla and other flavours can enhance it no end, I’ve tried a few teas like this and loved them. The key to success though is the spicy flavour and ideally cinnamon, if you can’t pick up on them it isn’t a proper Chai.